Reps. Sanford Bishop of Georgia (blue shirt) and Glenn Thompson of Pennsylvania pose with the Report to the Nation delegates. Both congressmen are members of the Congressional Scouting Caucus. Politicians may not align on every issue, but here’s one topic about which there’s near-unanimous agreement: Scouting helps prepare young men and young women for life. That message was delivered this week inside Senate committee rooms and around ornate conference tables. It was shared in the marble-lined hallways of the Capitol and in meeting areas normally reserved for heads of state. It was repeated by members of both political parties. 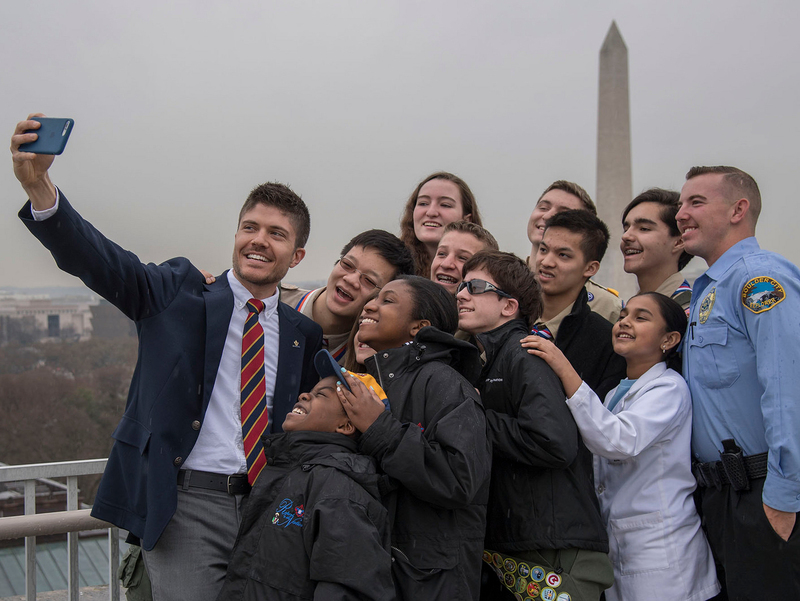 The Report to the Nation delegates — representing all four regions and four different BSA programs — were given rare access to some of our nation’s top leaders. In turn, these leaders met some of our country’s future leaders. Here’s what a few of them said about Scouting, in chronological order. Despite her busy job as Speaker of the House, Rep. Nancy Pelosi spent more than 15 minutes with the delegates. In 2007, Pelosi became the first female speaker in U.S. history. This fact gave Natalie MacEwan, a Venturer from California, a perfect opportunity to share some exciting news about the Boy Scouts of America. “We had more than 77,000 girls join Cub Scouts in the first six months,” Natalie said. She then presented Pelosi with a limited-edition “Scout Me In” neckerchief given to all members of Congress who met with the delegates. After hearing each delegate’s Scouting story, Pelosi offered a few parting words. Sen. Mitch McConnell visited with the delegates for a few minutes before he was due back on the Senate floor. He received a copy of the Report to the Nation and posed for a photo, copies of which his office will mail to each delegate. The remaining dignitaries listed here spoke at a special event for Eagle Scouts on Capitol Hill. On Wednesday, Eagle Scouts who work in Washington — and their invited guests — gathered inside a Senate committee room to rally support for Scouting. The first speaker was Sen. Mike Enzi, an Eagle Scout from Wyoming. He said that his motivation for earning Scouting’s highest honor was a leader who gave him a challenge. If Enzi wanted to attend the 1957 National Scout Jamboree at Valley Forge, he’d need to earn Eagle first. He did, and he’s been proud of his achievement ever since. Next, Enzi offered a trivia question: How many Eagle Scout awards have been given away in the history of the Boy Scouts of America? After a pause for dramatic effect, Enzi shared the answer. Rep. Jim Cooper said he never got to attend a National Jamboree or go on a trek at a high-adventure base. His transformative Scouting experiences happened closer to home: at Boxwell Scout Reservation in Tennessee. He echoed Enzi’s sentiment, encouraging everyone to keep the words “Eagle Scout” on their résumé for the rest of their lives. When he was 11 years old, Rep. Sanford Bishop started working on the Citizenship in the Nation merit badge. The badge developed within him an interest in the inner workings of government. “I never imagined that one day I would be living what I studied,” he said. Bishop said the Scout Oath and Scout Law have guided him throughout his life. “I certainly would not be the person I am today were it not for Scouting,” he said. Rep. Trent Kelly used his time to memorialize his boyhood Scoutmaster — a man named Richard Chisolm, who died on March 4. Kelly encouraged everyone to become a mentor like Chisolm, who affected countless young lives through his time as a volunteer. Rep. Chris Collins asked Isabella Messer of Maine to stand up and be recognized. Isabella, one of the first girls to join Scouts BSA, received a rousing applause from the room of Eagle Scouts. He encouraged Scouting alumni to find a way to remain involved in the program. Rep. Steve Stivers pointed to a member of his staff who had joined him at the event. Reiterating the theme of the evening, Stivers talked about the value of becoming an Eagle Scout. Find more coverage here, and follow me on Twitter (@bryanonscouting) and Instagram (@bryanonscouting). Photos by Michael Roytek and Randy Piland. See more photos here.